← Why “Through Him With Him In Him”? Let my YES wear combat boots…..
YES…three letters that can so quickly spring forth from our mouths. But what happens between the saying and the doing? Between the head and the heart? All kinds of distractions…and busy-ness…and second thoughts….and forgetfulness…and etc, etc etc. I want my YES to MOVE….yes MOVE, I want my YES to wear combat boots, stomping through all the mush of my brokenness that shows forth through the dragging of feet. I’m not interested in going through life with stiletto heels that get stuck in the mud and slow down the pace. 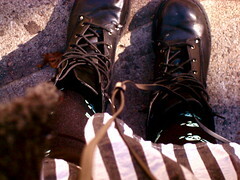 Today I say boldly, “Let me lace up the combat boots. May the YESes of my heart march forward!” Am I ready to truly walk this walk of RECEIVE, BELIEVE, ADORE?